Welcome to our new website which we hope you will find not only informative but also inspirational. When I began the restoration of the walled garden in 1994 there was nothing here at all, save for 5 apple trees, a few geese, redcurrant bushes, rhubarb patches and rolls of defunct barbed wire buried deep into the ground. It was a place of utter dereliction. In those far off days I couldn’t wait to get my hands on it and I leapt in without any real plans or thoughts as to what I was trying to achieve. Over the years I have changed several flower beds, moved things around, discarded a lot of the herbaceous and replaced many beds with block planting. Gardens are constantly changing which is half the fun. I am not a planner by nature, I am far too chaotic and you won’t find neat labels attached to every plant! I tried at the outset and I was either left with a label and a dead plant or neither, so although I try to name what I can, it is not guaranteed to be done! Michael is the Tree Man and the wild garden is now full of beautiful and exotic trees (most of which ARE labelled) and we have a wide and varied selection of herbaceous plants and a huge collection of David Austin English Roses. One of my passions is Clematis in varying forms and May is the time to see the Montanas which drape themselves liberally up trees and over the walls, they are impressive to say the least. Throughout the rest of the year there are several other varieties of Clematis which grow and continue to flower right up until the end of the year in some cases. I do often have a selection of Clematis for Sale. 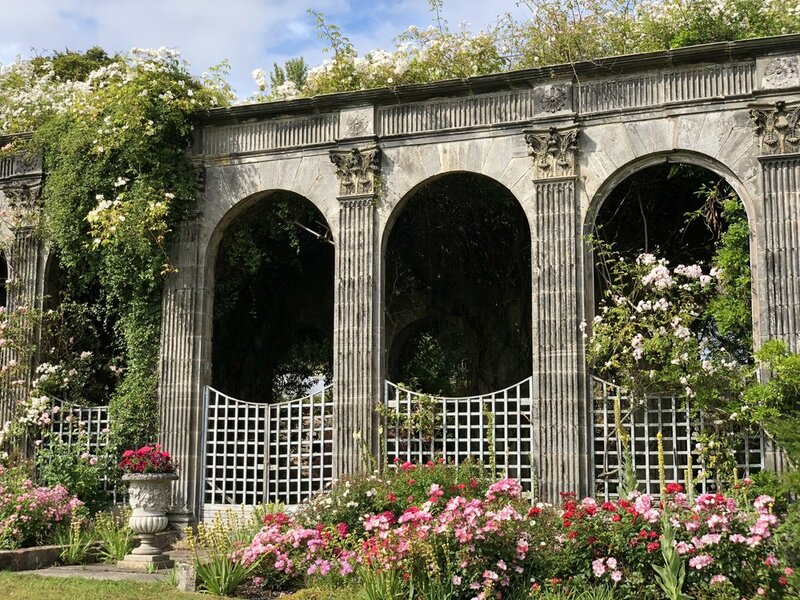 We are open again from April 2019 until the end of July and although there is not much to see in the Walled Garden until May, the woodland garden is well worth an earlier visit. We start with a fantastic display of Erythronium Revolutum which really are a stunning sight but it’s difficult to pinpoint when they will appear as they can sometimes be a good month apart. The earliest they have appeared is March 12th and latest I have ever seen them was May 7th. It all depends on the winter and early spring conditions. If you would like to see the Eryths please give me a ring in early March and I will be better placed to predict the time of their appearance, or you could keep an eye on Instagram, Facebook and my Blog which I aim to keep running throughout the main growing season. The bluebells also are a delicious sight along with the white pheasant eye Narcissi. If you are artistic and would like to come and paint, please feel free to stay all day and bring a picnic and if you would just like to come and spend some peaceful time in beautiful surroundings then please also feel free to come and stay as long as you wish with or without your picnic. The gardens here have something for everyone, you don’t have to be an avid plants person or gardener to enjoy what we have to offer. We look forward to seeing you whenever you choose to come (never at weekends though) and do bring your furry friends on a lead if you wish. Meanwhile a huge thank you to all of those who visited us this year either in groups or just passers-by, and please rest assured that you are all most welcome.